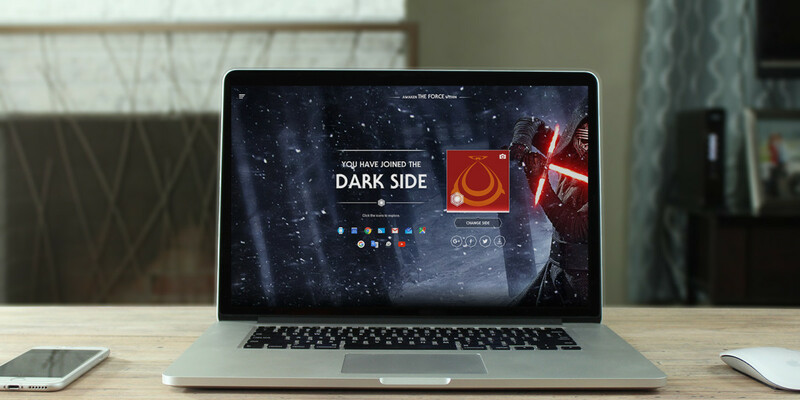 In anticipation of the the latest film in the Star Wars franchise, Google is offering users a choice between the light and the dark side of the force. Your decision will influence how your Google apps look. Visit google.com/starwars to take a side; you’ll then find new movie-themed backgrounds in Gmail and Chrome’s New tab page (optional). YouTube’s seek and volume controls take on a lightsaber-like glow. On Maps, your location marker becomes either a TIE fighter or an X-Wing. If you like, you can give your Google avatar a blue or red overlay to represent your allegiance. There are also a few changes in Google Translate, Waze, Chromecast, Google Now and Search. Oh, and if you use Calendar, you’ll spot new event entries for Star Wars events like the movie’s theatrical release. Google says it may take a few hours for its apps to update with your preference, so you might not see all the new themed changes immediately. It’s worth noting that these aren’t available for Google Apps accounts. Chrome, Gmail, and YouTube tweaks are only on the desktop apps, but the rest should also show up on your Android or iOS phone.